He watched “Bad Boys II” at his Daddy’s house and came home with a new word–the N word. I was so upset I cried trying to explain to him that people have died over that word. He was confused because African-Americans often call each other that word. I couldn’t seem to get across to him that he should never say, or even think, that word. When I was about 7 years old, one of my uncles said the N word at our house. My mother said, “I don’t ever want to hear that word in my house again.” I was a little scared by her tone, but knew it was significant. I grew up in a rural area with mostly white people, but with a few Mexican-American families. There was one African-American family–just one. After I married and moved to the suburbs of Detroit, I was so excited by the cultural diversity. I married into a Russian family, which introduced me to the Eastern Orthodox Church, which my Romanian ancestors attended, but was lost with the older generation. I grew up with Anne Frank and watching movies about the Holocaust. Anti-semitism didn’t touch me until I was an adult and I was shocked that some people didn’t like the Jews. My son has heard jokes about Jews, many times by Jewish comedians commenting on other Jews. One day he said, “Look out Jews, here comes Hitler.” I about had a heart attack. He said that he had just heard Stewie on Family Guy say that. Of course, I can’t seem to keep him from catching glimpses of these awful shows. I have been discussing the Jews a lot with my son lately and we are planning a trip to the Holocaust Museum this winter. I will leave you on a not-so-somber note. Many of my favorite authors are Jewish and I love all the cool Yiddish word–oy vey, schlep, putz, kvetsch, and schmuck. One day he overheard me say “schmuck” in a conversation with my sister. He asked me what it meant and I told him because I promised to always tell him the truth. Last week he came home from his dad’s. He said to me, “By the way, Mumma, South Park stole schmuck from us.” I was so caught off guard, I started laughing instead of telling him to stop watching that garbage. 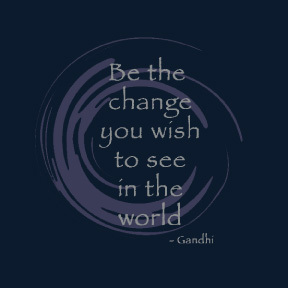 “Be the change you wish to see in the world.” Teach your children not to hate and the ripple effect will go on and on. This entry was posted in Inspiration, Quotes and tagged anti-semitism, change, cultural diversity, Gandhi, hate, quote, racism, xenophobia by Liza. Bookmark the permalink. As a Jewish American – its really nice to see someone take a look at what our current culture views as humor, whereas 50 years ago, was devastation. Thank you for your comment. It means a great deal to me. My family came from a tiny village in Romania (now Ukraine.) While doing research, I was looking at a chart of the ethnic make-up of the village. Around 1900, there were about 1200 Jews in the village, after the war–zero. When I saw that zero and it’s implication, a sob came out of me. I checked the neighboring village. Zero. I was changed that day. Beautifully put! This quote was my signature for probably the first year of my son’s life. I’d understood the importance of kind words, but underestimated the importance of many small kind acts, and how the ripples of each such small act spread out and create like ripples beyond where they’d be expected. So, too, does negativity in its various forms. I always think of the show Scrubs, which demonstrated the same in a short, perfect montage. Be the change that you wish to see in yourself, and your world will follow.